Wright State nursing professor Rosemary Eustace completed a prestigious Carnegie African Diaspora Fellowship in her native Tanzania. 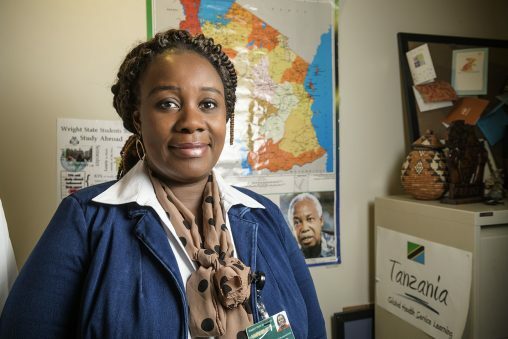 In her native Tanzania, she was among the first college graduates in nursing. And now, Rosemary Eustace, an associate professor of nursing at Wright State University, is heavily involved in educating nursing students. Most recently, Eustace completed a prestigious Carnegie African Diaspora Fellowship, which took her to Tanzania from May to July. Prior to that — over a four-year period — she had taken an interdisciplinary group of Wright State students to the East African nation to interact with their counterparts and the Tanzania community and learn about global health as part of a formal study-abroad program. “We want our students to understand them and work together,” said Eustace. The fellowship program sends African-born scholars who are currently teaching at American or Canadian universities to Africa for up to 90 days to work with faculty at African institutions on curriculum development, research and graduate teaching, training or mentoring activities. Similar to the Peace Corps and Fulbright programs, it is designed to harness the expertise of Africa-born Fellows in North America to improve higher education standards in Africa. The fellowship is offered by the Institute of International Education in partnership with the United States International University-Africa and is funded by a grant from the Carnegie Corporation of New York. Over the past four years, over 270 fellowships at more than 100 African universities have been funded. Eustace said the fellowship enabled her to strengthen the relationships she had developed in previous trips to Tanzania, allowing her to better connect directly with Tanzanian faculty and students and help build their programs. She also collaborated with Tanzanian faculty on their research efforts and worked on a research project proposal that involves the role families play in breast cancer screening and awareness. Eustace was born in Tanzania, then lived for three years in Kenya before moving back to Tanzania. She grew up in a middle-class home in Mwadui, a township owned by a Williamson Diamond company, but after her father was killed in a car accident, the family had little source of income. So Eustace, then 17 years old, her mother and her five brothers and two sisters moved to a village, where they formerly lived in a “mud house” with a small single bedroom and living room. Eustace earned her bachelor’s degree in nursing from the Muhimbili University of Health and Allied Sciences in Dar es Salaam in 1994 and was part of the first cohort of nursing graduates in Tanzania. The Muhimbili University of Health and Allied Sciences by then was the sole college conferring degrees in health-related programs. “We were trained and prepared to become nurse educators,” said Eustace, who began working as a nurse instructor at the Muhimbili School of Nurse Teachers after graduation. In 1998, Eustace’s husband won a scholarship to study at Kansas State University and a year later she joined him there. She earned her master’s degree and Ph.D. in family science at Kansas State and in 2007 moved to Dayton, where her husband had landed a job as faculty at the University of Dayton. Eustace worked at Miami Valley Hospital as a clinical staff nurse, in 2008 got a job as a research associate at Wright State’s Boonshoft School of Medicine doing health screenings. In 2010, she earned her master’s degree in community/public health nursing – clinical nurse specialist from Wright State. “That opened a lot of doors,” said Eustace, who joined the Wright State faculty that same year. She teaches family nursing and community and public health nursing.